These quick and creamy Crab Stuffed Mushrooms are filled with fresh crab, cream cheese, bread crumbs, garlic and Parmesan making them the perfect appetizer. They are easy to prepare and delicious for your holiday entertaining. Do you like mushrooms? I absolutely love them. As a matter of fact I don’t think I have ever met a mushroom that I did not like. But mushrooms are a lot like coconut and cilantro either you love it or you hate it. Stuffed mushrooms are simply amazing. The entertaining season is coming up and what better way is there to amaze your quests than with spectacular appetizers. Do you like to entertain? I just love it. It is so much fun. I love the whole planning aspect of it. This time of the year is perfect for it. The weather is so nice that it makes outdoor entertaining so enjoyable. 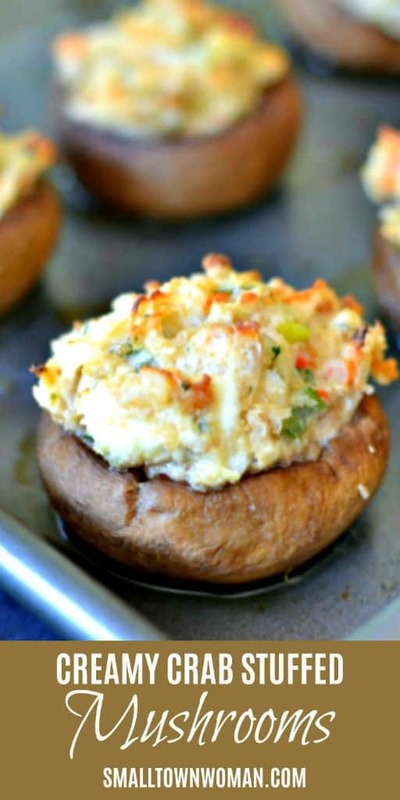 These Quick and Creamy Crab Stuffed Mushrooms are the perfect party appetizer. They are quick to prep, quick to cook and can even be reheated in the microwave. My quests just rant and rave about them. I use fresh crab-meat but you don’t need a lot of it. You can even sub shrimp or do something really crazy like do a crab and shrimp combo. They bake in no time at all and are even perfect as a main entree with a simple tossed spring green salad with a light vinaigrette. What is the best crab to use for Crab Stuffed Mushrooms. I personally like Alaskan King Crab but it may be what I am used to here in the Midwest. Delicious, bright white meat, but it is slightly difficult to get out of the hard spiny shell. With a good pair of kitchen scissors it can be done. Snow Crab would be a close second. Much easier to get out of the shell but also less available in my neck of the woods. Ask any north-easterner and they will swear that these are best made with blue crab. I am not familiar enough with that crab to testify to that but my readers tell me all about it all the time. Unless you live near an ocean you may be limited in your crab choices. 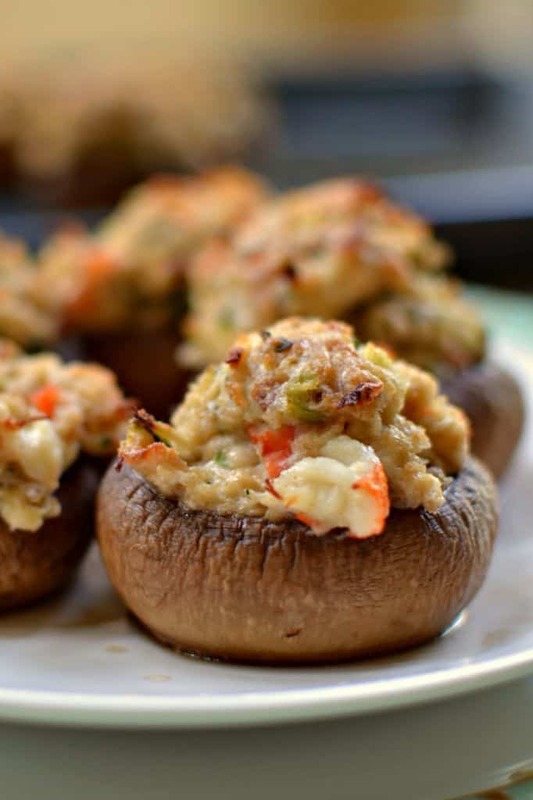 How to make these quick and creamy Crab Stuffed Mushrooms. I got this hint from a reader. Precook your mushrooms for about 2-3 minutes. Turn upside down on a rack and allow to drain so they don’t drip when you bite into them. If you like things to pack a little punch than add a little bit of cayenne pepper or crushed red pepper. I use the great big button mushrooms but for a party you certainly could use the smaller mushrooms and this recipe would go further. Just remember to reduce your cooking time by a few minutes for the smaller mushrooms. Use cooked crab meat and chop it up pretty fine. Freshly grated Parmesan cheese is a must. It has much better flavored than the stuff in the canister so use it. Fresh bread crumbs are amazing in this recipe. You can always use croutons and crush them in a bag or a food processor. Most croutons have less preservatives and artificial ingredients than processed bread crumbs. So what are you waiting for? 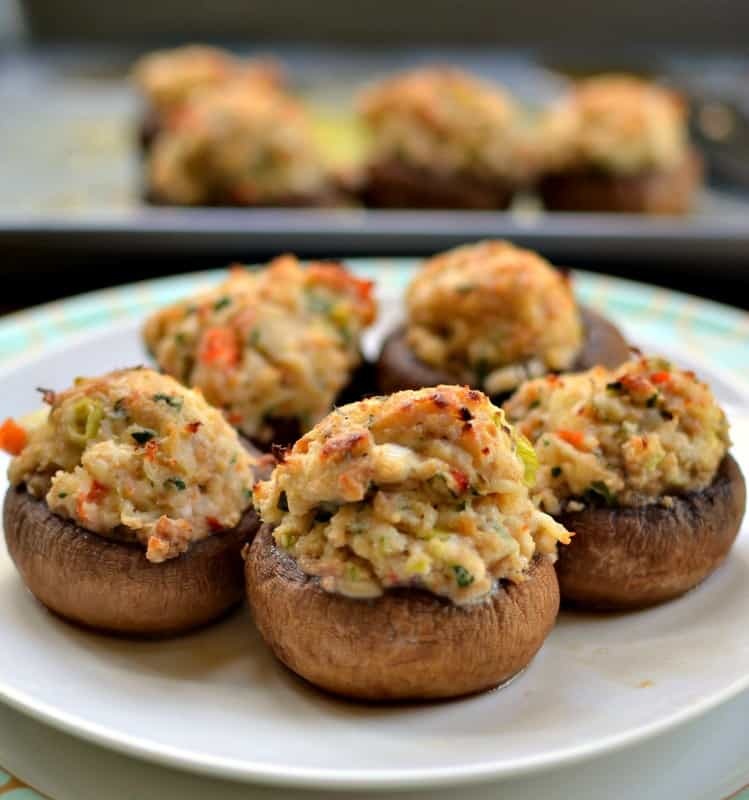 These tasty gorgeous Crab Stuffed Mushrooms could be all yours in a matter of 30 minutes or less!! This post was originally published September 2, 2017 and was republished November 26, 2018 with new content. 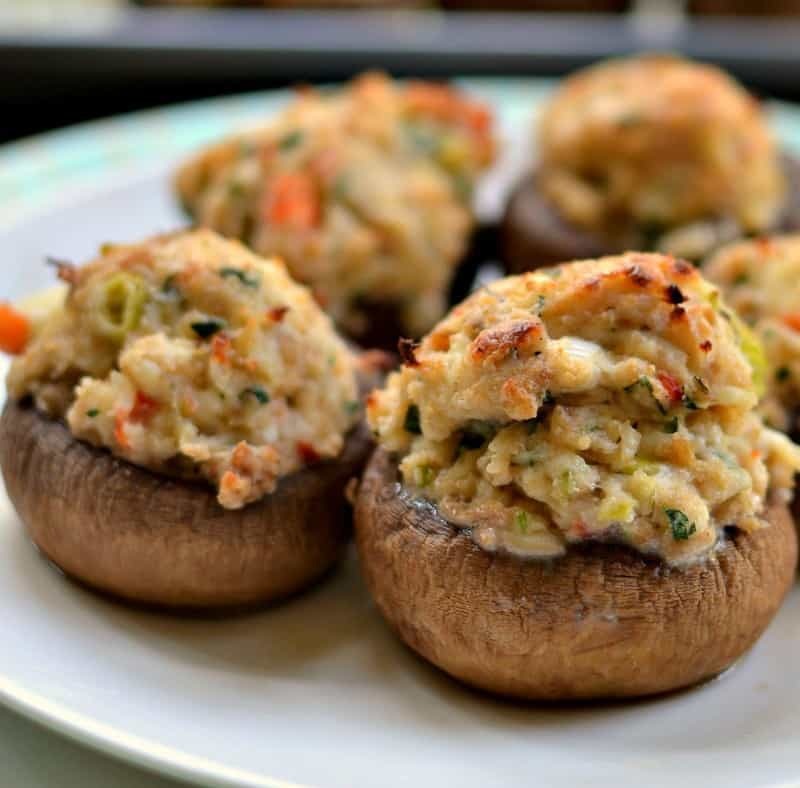 These quick and creamy Crab Stuffed Mushrooms are filled with fresh crab, cream cheese, bread crumbs, garlic and Parmesan making them the perfect appetizer. Lightly spray mushrooms with olive oil spray and arrange mushrooms cap side down on a cookie sheet. In a large bowl mix cream cheese, bread crumbs, garlic, Worcestershire sauce, green onions, Parmesan, parsley and crab. Scoop about 1 1/2 tablespoons of filling into each mushroom. Bake for 20 minutes. Turn the broiler on the last minute of cooking to lightly brown the tops. Stay close by as I have always found broilers unpredictable. You can add 1/4 teaspoon cayenne pepper or 1/4 teaspoon crushed red pepper for a little kick. When I click print I get a blank screen. ? The amount of ingredients in the recipe at the bottom of each page/post. Please let me know if you need more help. Copy and paste to a blank “notepad” and then print from that. FAB-U-LOUS! I added red pepper for some heat and loved them. Thank you! THANK YOU!! Yes I like a little heat too. Thanks for stopping by!! Thank you and you are most welcome. Compliments like these make my day! My caregivers fixed this for me tonight and it is FABULOUS! Awesome! I am so glad that you liked them! I made these as the appetizer for my Dinner Party last night and they were a HUGE hit! Creamy & so good and they were easy – making them in a few weeks for Wine Club! Thank you so much and so glad that you liked them! I appreciate the complement! You made my day!! Can these be assembled ahead of time and then cooked the next day? Yes they can. I would try to set them out for about 30 minutes before cooking to bring to room temperature. Thank you! These will be on my Thanksgiving menu. Thanks so much! I appreciate your kind words. I would need your email address. Do not post it here. Instead email it to me [email protected] Thanks! Can imitation crab be used in place of the real thing? I’ve heard muchrooms can get watery when cooking. I haven’t tried the recipe yet as this concerns me. What can I expect when the mushrooms have finished cooking? Their might be some moisture on the cookie sheet but not a whole lot however just be careful getting them out of the oven and also carefully remove to separate platter as soon as you can. Remember to dry your mushrooms after washing to help with this. If you look in the pictures you will see a small ring of moisture around each mushrooms after they were baked on the cookie sheet. This should give you an idea of what I am talking about. Thank you for your prompt and thorough reply. I’m very excited to try your recipe and hopefully impress my family with it. Have a wonderful Thanksgiving! Theae look deliciois going to make them for Christmas Eve. Awesome! Thanks so much! Merry Christmas! I plan to make these tonight to serve as an app tomorrow. Are the mushroom caps pre-cooked before filled, or just when all put together? Thanks. They look awesome. They are not pre-cooked. I guess you are going to assemble and cook tomorrow? Looks good. What about Italian bread crumbs? This was a big hit on Christmas. Thank you so much! is it really 1/2cup green onions , sounds alot for this ? I am on my way out the door. The recipe will be fine if you cut it back. Can I use portabella muahrooms? They might be a little large to bake the crab stuffing all the way through. If you try I would make a thin layer on them…not as poofy as I did with the white button mushrooms. Let us know how it turns out! Do you think this recipe would also be appropriate to be served as a dip? How would you suggest altering it if not? I am serving a party next week and some guests don’t like mushrooms I would like the dip as an alternative. Sorry about the delayed response. I was thinking about what you asked. I guess it depends on what you are serving the dip with. If you are serving with celery sticks, pepper slices and maybe some crostini I think it would work. I don’t think chips are going to be sturdy enough or do well with it because of the breadcrumbs. I do think you will need a small soft cheese knife so that it can be scooped up if need be and spread on the crostini. Let me know if you want me to search my blogging friends sites looking for a crab dip. I would be happy to do that. Can I sub left over turkey? I have not tried but I think that you could. If you decide to try please let us know how they turned out. Ok girl! I live near Baltimore MD so I take my crab very seriously. But your recipes are so delicious I’m giving these a try. I’ll let you know what I think. Thanks for sharing! LOL! Thanks so much! Sounds like a great plan. The pleasure is all mine. Loved them! Will make again. Thanks so much Maryann. I so glad that you liked them! I’ve been making these for years and I cut the stems and onions and microwave them for about a minute first to soften. I also precook the mushroom caps in oven for 2-3 minutes and then drain them upside down of a rack to get the excess liquid out so when eating them it does not drip down when you bit into them. Two with other appetizers. Four as a mail meal with a side salad. These will be a crowd pleaser for sure! Thanks for sharing! Thanks so much Karly! They really are delicious! Can I reheat in the microwave? Yes you can at a reduced power. Use a reduced power of 40-50 percent and don’t overheat so you don’t dry out the crab too much. We tried the recipe. I doubled the garlic as well as added the Crushed Red Peppers. I was a bit unimpressed. We are going to try the recipe again with half the cream cheese. Can you use claw crab meat. This is such and easy and delicious appetizer. It was the first to disappear at our weekly game night! Thanks so much Missy! I am so glad that you enjoyed them!! I sometimes use a drop of Vermouth in a pan and stream the mushrooms. Iust 2monutes Such a great flavour .Just like a Martini .Jst a swish and a little butter.Then bake with stuffing. Sounds delicious! Thanks for the heads up! I will have to give it a try!! This recipe is so quick and easy! It’s a keeper for sure! Thanks so much Christina! We love it too! Crabbed stuffed into mushrooms?? Yes please! Thank you for this recipe, my family loved them. Even got the kids to eat them!! Wow Nicole that is fabulous! So glad that the whole family liked them! They are pretty yummy! Mmm, my husband would go gaga for these. OMG, they look scrumptious. Thanks for sharing this recipe! Those sound amazing. What I love about stuffed mushrooms is that you can serve them as appetizers or you can serve up a plate of them as a main dish. They are so good! You should give them a try this coming weekend! What a delicious meal idea! I love mushrooms and crab so would love to eat this. These look incredible! I’m not normally a big fan of mushrooms, but this is a recipe I’d try! Thanks so much Erin! They are truly delicious! My pleasure! I hope you enjoy them!! I haven’t taken mushrooms for a long time, am glad to have found this recipe that has something around mushrooms. Thanks for sharing. We are hosting a small gathering soon and these would be a big hit! They look perfect! I love mushrooms as well. This sounds delicious and are cute too. I will have to make these next time we have guests over – its nice to have some new recipes to try. Thanks so much Marysa! They are delicious! Oh yum that looks absolutely delectable! I will be sure to try out the recipe. Thank you for sharing. Wow! These look really good & not too hard at all. Such a nice recipe! Saving for others in my family that would love it. Thanks! Thank you Samantha! I hope you enjoy them as much as we do!! i’ve made stuffed mushrooms a variety of ways. but never tried them with crab. this looks good! Oh these look absolutely marvelous! I’d love to try these! I am not a huge mushroom fan but I LoVe crab!! So I would be willing to try for sure. Looks yummy! Thank you! They are so delicious! I wish I had some right now! 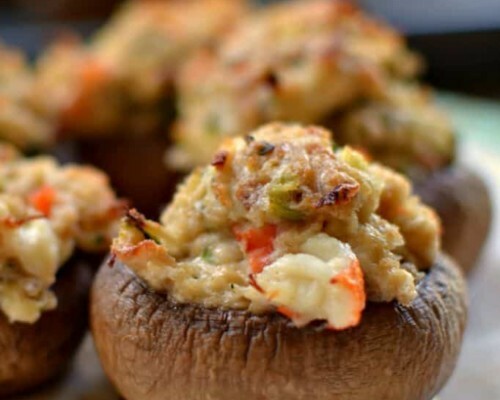 These crab filled mushrooms look amazing, one of my favorite appetizers. Our local farmer’s market has a signature stuffed mushroom recipe with bacon and lots and lots of butter. I don’t think there is an appetizer that I don’t like. These are no different. Made a slight variation by omitting the crab (allergic), but just added artichokes instead– delish! Loved this one. I love stuffed mushrooms! This is a recipe I look forward to making soon! They look super easy to make too! Thanks Brianne! Yes they are easy to make! Our local sushi restaurant prepares these, and they are always so delicious! I’m so glad I now have a recipe to make them on my own! These look like they would make the perfect appetizer. Something easy to make when you’re having some people over. So true! Thanks Nina! You should fix them. You will love them! This recipe looks and sounds super tasty. Bookmarking this. What a healthy, delicious and easy recipe to make for my family. I am sure everyone would love this dish. Yummmm I love crab with anything, but when it’s in mushrooms like this, it’s even more delicious! Crab Stuffed Mushrooms have always been a favorite appetizer of mine. These look absolutely mouthwatering and perfect for March Madness weeks ahead. Love the tip you gave about the croutons for bread crumbs. I didn’t know that. Thanks for the great recipe. This looks like the yummiest appetizer out there! I need to try these out! Thanks Emily! I hope you enjoy them! They are super delicious!